Mr. Thorpe will be played by Martin Sensmeier (Tlingit, Koyukon-Athabascan), Angelina Jolie will be serving as co producer. 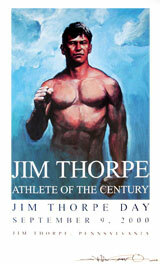 Voted ABC's Wide World of Sports Athlete of the Century. 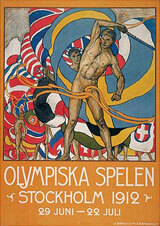 Won Olympic 1912 gold medals for the Decathlon and the Pentathlon. 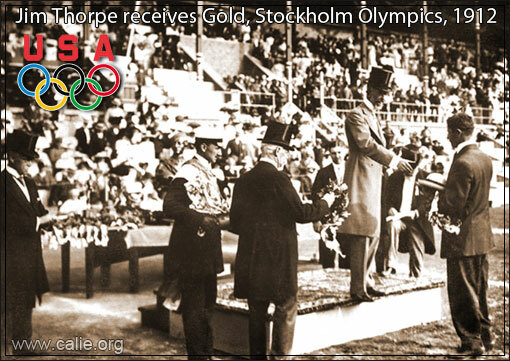 American Olympic Gold: King Gustav V of Sweden presents an Olympic gold medal and wreath to 25-year-old Jim Thorpe (Sac and Fox American Indian) and proclaims him "the greatest athlete in the world," Stockholm Summer Olympics, 1912. 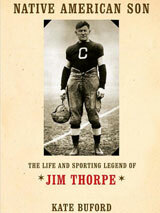 "(Jim Thorpe) was the greatest athlete who ever lived.... What he had was natural ability. There wasn't anything he couldn't do. All he had to see is someone doin' something and he tried it... and he'd do it better." 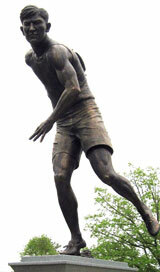 Two other famous American Indian Olympians who participated in the 1912 Summer Games are Andrew Sockalexis (Penobscot Nation) and Lewis Tewanima (Hopi). Sockalexis finished fourth in the men's marathon, and Tewanima won Silver for 10,000-meter footrace. 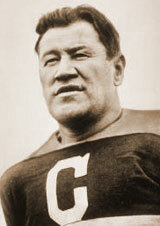 Tewanima was Thorpe's teammate at the Carlisle school. 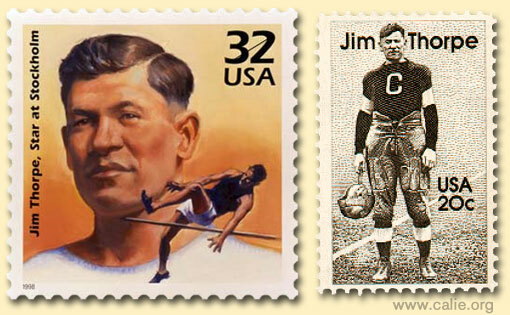 FAMOUS NATIVE AMERICAN INDIAN POSTAGE STAMPS USPS (l-r): "Jim Thorpe, Star at Stockholm" commemorative postage stamp, 1998; classic Jim Thorpe image in Carlisle football uniform holding football helmet, 1984. 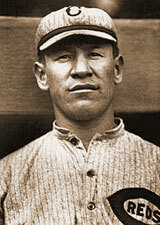 In 1913, Jim Thorpe was stripped of his Olympic medals because it was discovered he had been paid for playing two seasons of minor league baseball (disqualifying him of Olympic amateur status rule), and his 1912 Olympic Herculean feats were ordered stricken from the record books. After 1929 when he retired from professional sports, he was heavily abusing alcohol and had trouble holding a job in The Great Depression. 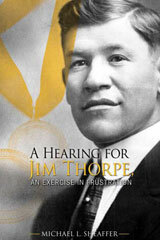 When Thorpe died in 1953 of a heart attack, he was destitute, a broken man of a broken dream. But in 1982, the International Olympic Committee (IOC) approved Thorpe's reinstatement, and in 1983, the IOC presented Thorpe's children with commemorative medals. 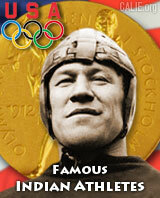 His original 1912 gold medals had been stolen from a museum and have never been recovered. Join us for an exciting week of athletic competition in Oklahoma City. 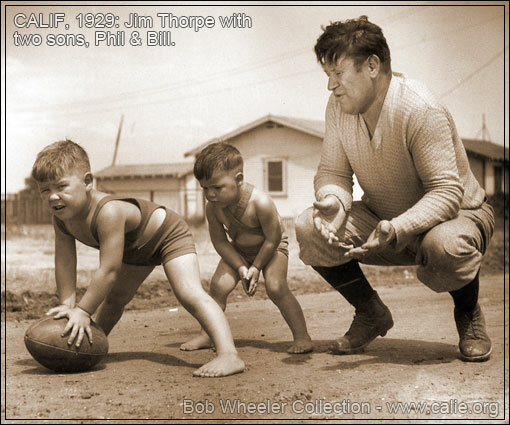 CALIFORNIA 1929 — Jim Thorpe pictured playing football with two of his young boys, Bill and Carl Phillip "Phil" Thorpe. Proud father with his two sons. 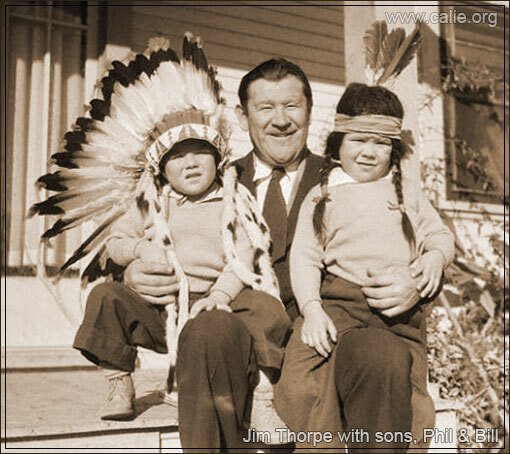 Jim Thorpe Rest In Peace website seeks to inform the public about the issues surrounding the request from Jim Thorpe’s sons and the Sac & Fox Nation to the Borough of Jim Thorpe, PA to return Jim’s remains to his sons for proper reburial in Sac & Fox Nation land in Oklahoma. 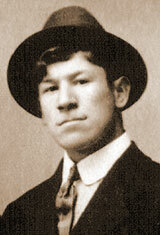 In addition, we seek to bring pressure to bear by means of a petition to the Borough of Jim Thorpe, PA for the release of Jim’s remains. 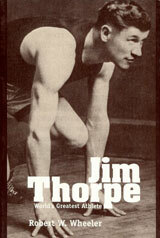 The Jim Thorpe Award was created in 1986 in honor of Mr. Thorpe. 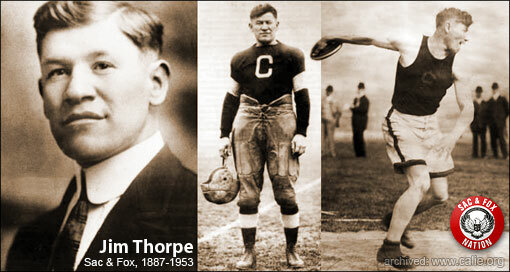 Each year, a committee of the Jim Thorpe Association votes and awards the prize to their top college football defensive back pick. Some 25 recipients have received the prestigious award (2011). 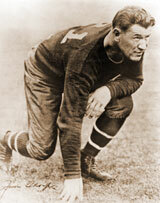 Jacobus Franciscus "Jim" Thorpe (1887-1953). 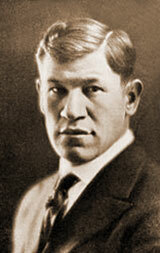 Born May 28, 1887, near Prague, Oklahoma. 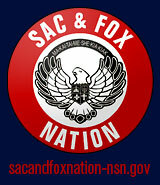 Tribal: Sac & Fox mother, Sac & Fox Nation, Oklahoma. Raised in Sac & Fox community. Education: Carlisle Industrial School, Pennsylvania. 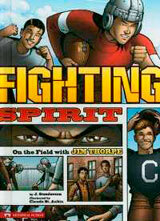 Sports: Baseball, Basketball, Football, Track & Field. 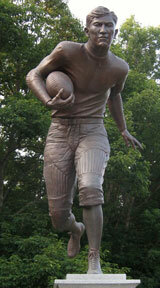 Pro Football Hall of Fame: Inducted 1963. 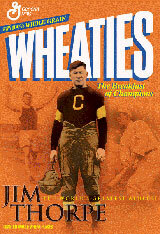 • Charter president and founding member of the American Professional Football Conference (1920), which was renamed the National Football League in 1922. • Member of the Canton Bulldogs of Ohio League (1915-1919). 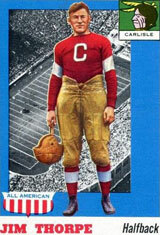 • Played eight years in NFL: Bulldogs (1920, 1926); Cleveland Indians (1921); Oorang Indians (1922-1923); Toledo Maroons (1923); Rock Island Independents (1924); New York Giants (1925); Chicago Cardinals (1928). 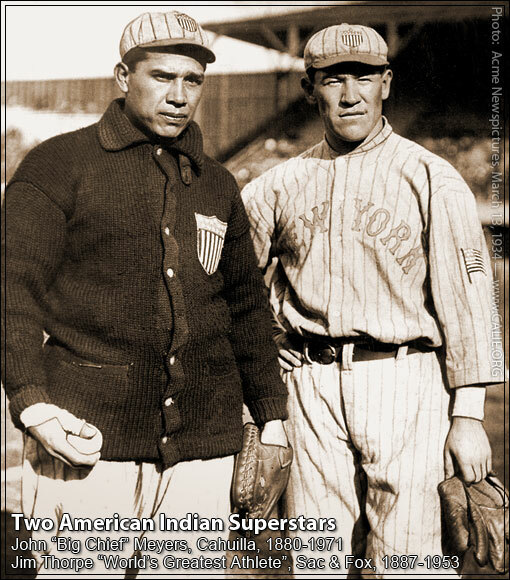 Two superstar American Indian sports legends (circa 1910s? 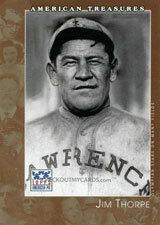 ), Jim Thorpe (Sac & Fox) and his teammate and friend, John Chief Myers (Cahuilla, Riverside, Calif.), pictured in their New York Giants baseball uniforms. Photo: Acme Newspictures stamped this photo on the back dated 1934, but that may be the year they printed or published it with a news article. 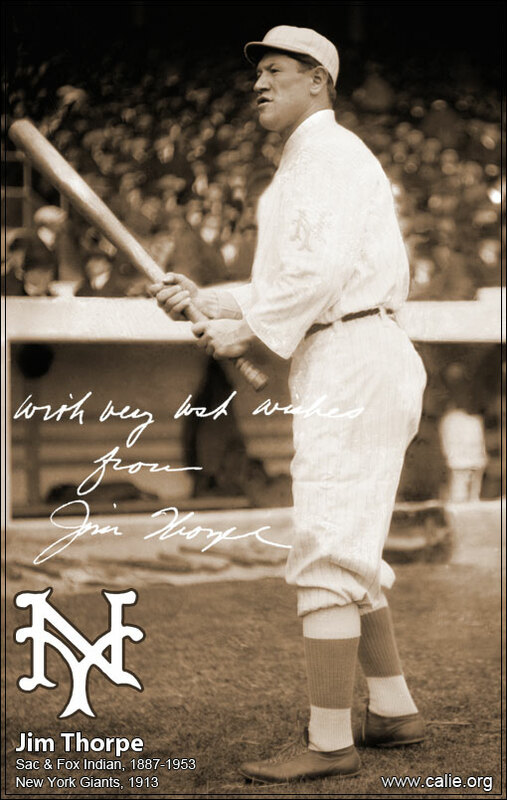 Jim Thorp pictured in his Giants baseball uniform holding a baseball bat in 1913 at the Polo Grounds in New York. Authentic 1913 New York Giants baseball logo digitally inserted. 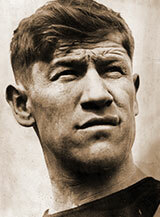 Jim Thorpe signature autograph scanned from an other authenticated document and it was also superimposed into this image using Adobe Photoshop. 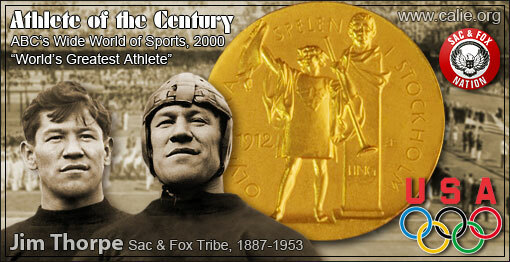 Question: What did the "C" stand for on Jim Thorpe's chest in his famous sports pictures? 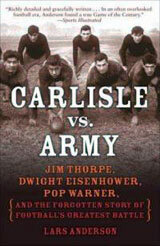 Answer: As seen in the following two Jim Thorp photos, the C could be mistaken for Jim Thorpe's college football team jersey, the Carlisle Industrial Indian School, Carlisle, Pennsylvania. 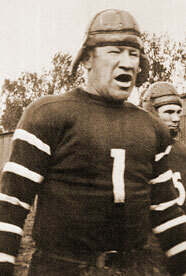 But as Wikipedia has noted in this picture of Jim Thorp wearing a team C on his jersey chest, he's wearing his Canton Bulldogs uniform, c. 1915 – c. 1920. 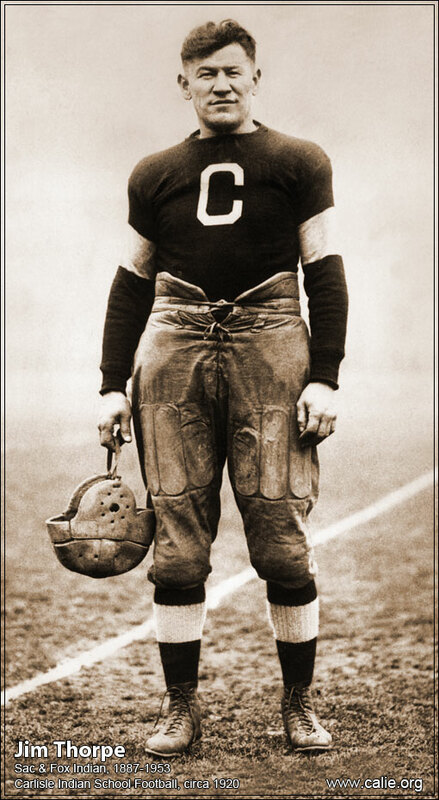 THE WORLD'S GREATEST ATHLETE — Native All American international superstar athlete Jim Thorpe pictured in his Carlisle school Indians football uniform, circa 1920. 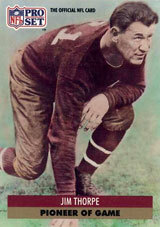 Note: Wikipedia has this photo of Jim Thorp wearing a team C on his jersey chest captioned as the Canton Bulldogs uniform, c. 1915 – c. 1920. However, the uniform logo below looks too close to call for this webmaster to question Wikipedia research. 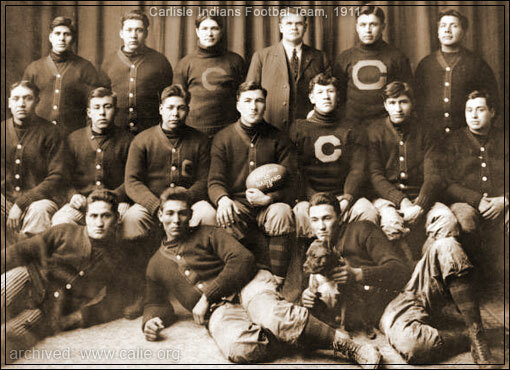 Carlisle Indians football team pictured in 1911. 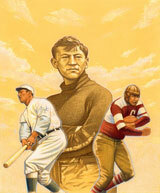 Note: Jim Thorpe is pictured center row, third from right (with a bold "C" on his chest). The Carlisle college is a famous Native American Indian school. 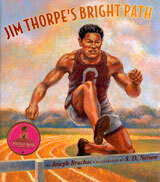 The American Indian school system (1850-2011) was a highly controversial U.S. government program and well-established in 1904 when Jim Thorpe arrived at the Carlisle school. 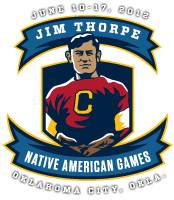 Scholars today refer to the US government program in its early form as "cultural genocide" — but many American Indians who attended the so-called Indian schools, including Jim Thorpe, seemed to thrive at the opportunities they provided. 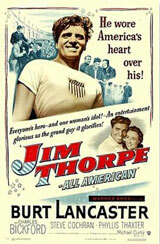 When Mr. Thorpe's athletic career was ending in 1929, The Great Depression was just beginning and he had trouble getting and maintaining work and supporting his family — naturally, he found work as a Hollywood actor and may have appeared in as many as 59 movies. 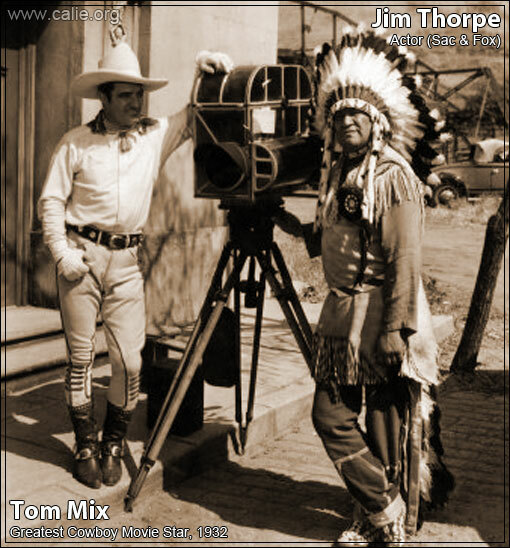 NATIVE AMERICAN INDIAN ACTOR Jim Thorpe worked as an actor after his professional sports career — pictured on a 1932 movie set with Tom Mix, "The Greatest Cowboy Movie Star" actor of his time (that's someold-time antique vintage Hollywood motion picture camera they are leaning on!). 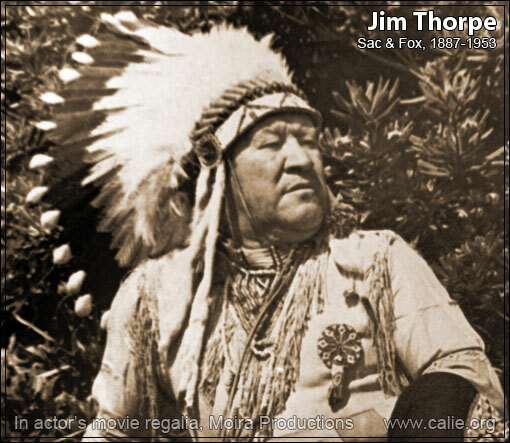 Native American plains war bonnet, beaded moccasins — the tribal regalia Mr. Thorpe is wearing is most likely Hollywood film wardrobe for the movie he was working on. 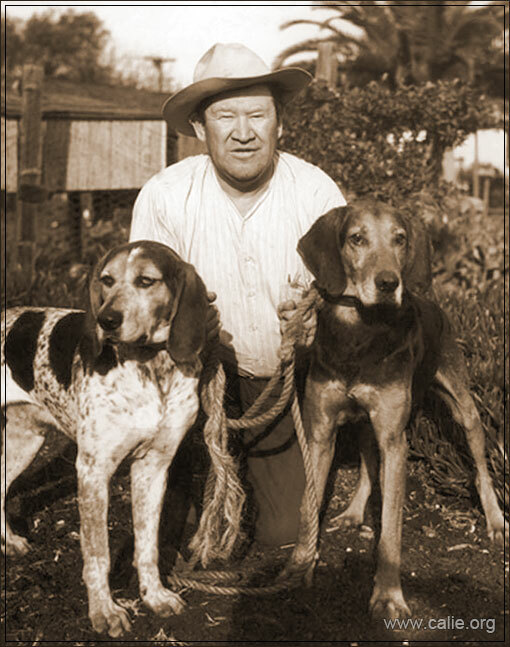 Jim Thorpe, legendary American Indian athlete and 20th century Hollywood film actor, poses for a photo with two dogs. 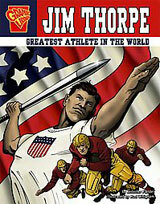 PLAY "Jim Thorpe The World's Greatest Athlete" (2009) Official Trailer. 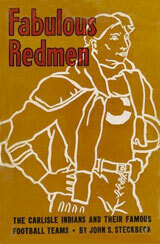 Presented by Native American Public Television, A Moira Productions Film in association with Dateline Productions. 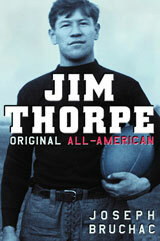 PLAY "Jim Thorpe All-American" (1951) Trailer starring Burt Lancaster as Jim Thorpe. 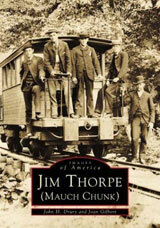 PLAY: One Run Elmer clip, Jim Thorpe Buster Keaton 1935.